Do you love being out in the fresh air? If the idea of being stuck inside at work for at least eight hours a day makes you want to cry, one of these outdoor careers could be right for you. There is a downside to working outside though. It sometimes means you are exposed to inclement weather or other uncomfortable conditions. Masons use concrete blocks, bricks or natural stones to build structures like walkways, walls, and fences. You can train for this occupation by doing an apprenticeship that combines practical and classroom training. Agricultural managers oversee the operation of farms, ranches, nurseries and similar businesses. They supervise workers who tend to daily tasks. 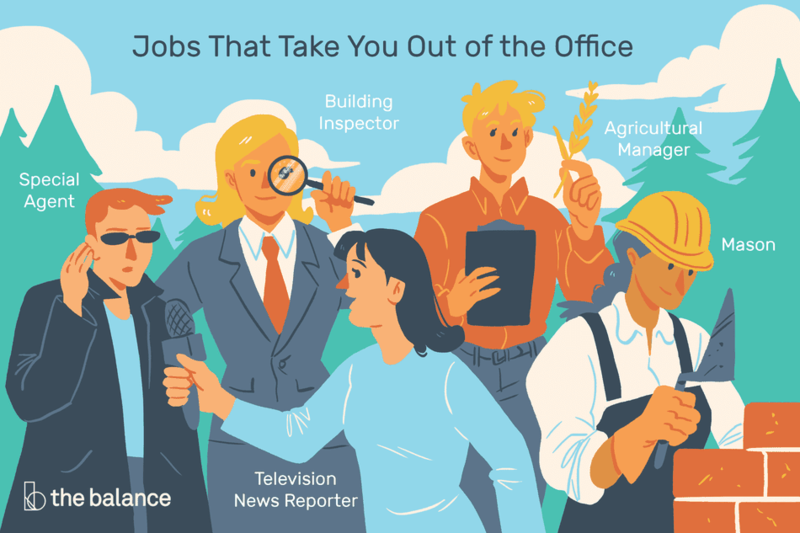 Although they spend a lot of their time outdoors, agricultural managers also work in offices where they plan budgets, keep records, arrange for maintenance of equipment, and purchase supplies. Training often takes place on the job. Some agricultural managers have college degrees in agriculture. EMTs and paramedics spend their days traveling in an ambulance to treat patients who are injured or have suddenly become ill. They must work wherever the event has occurred, which may be in someone's home, but could be on the side of a busy highway or somewhere else outdoors. To become an EMT you will have to do postsecondary training at a community college or technical institute and then become licensed by the state in which you want to work. You will need to earn an associate degree if you decide to become a paramedic. Glaziers cut, fit, install, and repair glass in residential and commercial buildings. They often work outdoors, standing on scaffolds and ladders as they install windows and glass plates on buildings. This requires them to be strong and have good balance. Conservationists, also called soil and water conservationists or conservation scientists, look for ways to use natural resources that do not harm the environment. While they spend some time in offices, they must also work outdoors where they are exposed to inclement weather, poisonous plants, and stinging or biting insects. If you want to work in this field, you will have to get a bachelor's degree in environmental science, biology, forestry, agronomy or agricultural science. Construction and building inspectors make sure that new and existing construction meets federal and local codes, zoning regulations, and ordinances. They inspect houses, office buildings, roads, bridges, tunnels, and dams. Many of their tasks have them at worksites, but some involve tending to tasks in an office. You can often work as an inspector if you have work experience in the construction trades. If you don't have this type of background, you may be able to enter this field after taking courses in architecture or engineering or getting an associate degree in building inspection and construction technology. Special agents, also known as detectives, look for violations of laws. They gather evidence and interview victims, witnesses and suspects. Although they spend a lot of time behind a desk, their work also takes them outside as they investigate crime and accident scenes. The best way to become a special agent is to start your career as a police officer. While many law enforcement agencies accept job candidates who have just a high school diploma, others require at least some college coursework if not an associate or bachelor's degree. HVAC technicians install, maintain or repair heating and cooling systems. Some people who work in this occupation specialize in one or the other system, and in either installation, maintenance, or repair. Work usually keeps HVAC technicians indoors, but some jobs take them outdoors where they may have to work in bad weather. If you want to become an HVAC technician, find an apprenticeship through a local union. Television news reporters investigate and report stories to viewers. Their work includes conducting interviews and observing events outdoors where they are frequently exposed to inclement weather. You will need to earn a bachelor's degree in journalism or mass communication if you want to work as a tv reporter. Some employers might hire you if you have a degree in another subject. Hydrologists, who are experts in the earth's most basic resource, water, solve problems including flooding and drought. Their work takes them outdoors where they must wade into lakes and rivers to collect samples. They also spend some time in offices analyzing data on computers. While you might be able to find work as a hydrologist if you have a bachelor's degree, your chances are much better if you earn a master's degree in environmental science, engineering, or geoscience, with a concentration in hydrology. Assessors analyze the values of groups of homes to determine how much property tax owners have to pay. To evaluate properties, they conduct site visits. They spend a lot of time in the office as well. State assessor boards, or individual municipalities where a state board does not exist, typically set education and training requirements.